Celebrities are often decked out in expensive clothing from the latest fashion collections, which certainly helps them look good in their clothes. But there’s 1 secret to getting any outfit to look just right—tailoring. Speak to any personal stylist to the stars and they’ll tell you, in order for a star to get that “I look fabulous” look, regardless of their outfit, every piece of clothing they wear—jeans, t-shirts, shorts, skirts, dresses, etc.—will have been tailored for a perfect fit. Nothing beats a good pair of socks. Socks keep your feet warm and comfortable. And during the winter months, your socks can do something else, save your feet when you insist on owning cute-but-not-comfortable shoes, or in the case of wintertime—boots. Boots are typically one of the highest priced items in a wardrobe, and that’s why when you buy a pair of boots and they aren’t comfortable, it can be a difficult decision to get rid of them. But all of that can change, with a simple switch of what type of socks you pair with your winter boots. Living in a Northern climate, at this time of year the daily temperature in my area can run cold—very cold. How cold? Last week our daily high was 0F, and with the wind chill it was -10F. With those types of temperatures the easy solution of simply cranking up the heat isn’t always going to work. Heating systems are often inefficient, leaving a second floor boiling hot while struggling to warm up a cold a first floor. Forced hot air can also dry out your eyes and nasal passages. When the weather grows cold, you can take a few steps to dress warm so that you don’t have to raise the heat and burn out your furnace. But dressing warm doesn’t mean you have to look like a marshmallow, especially when indoors wearing a down coat or parka isn’t really comfortable. Here are my favorite steps to staying warm indoors, without the bulk. The following is a guest post from Peter, a men’s fashion writer at Gentleman Zone magazine from UK and Australia. Besides writing he worked as a grooming consultant for many fashion events around UK & Europe. Today Peter is joining Shopping Brake to share his advice on dressing for a winter wedding. For more tips follow Peter on Twitter. Just as you got a hang of fall wedding style the season changed, and the wedding invitations kept on rolling in. Repeating an outfit is no longer possible so you’ll have to start planning and experimenting again. To make the process easier and more pleasant we have a few tips for you. You always want to look your best when you’re attending a wedding and whether you are a man or a woman these simple steps will get you where you’re going in style. My new velvet blazer from White House Black Market. One fabric that I see year after year in both fall and winter collections is velvet. This timeless fabric consists of densely woven, raised fibers that are soft to the touch. Velvet garments are costly to produce. Two fabrics of same thickness are woven together, then cut apart and rolled onto separate rolls before using. The laborious manufacturing process and high price tag is why velvet was often associated with nobility. Another form of velvet that typically pops up in fall and winter collections is corduroy, which is a raised form of velvet. Save your pilling sweaters with the Laundress Sweater Comb. Nothing makes one of my favorite sweaters a candidate for the donate pile faster than pilling. If you’ve ever seen a sweater with little balls of fabric then you already know what I’m talking about. Pilling is bundles of fabric that have broken off and become tangled, thus forming little balls on the surface of the garment. Pilling is a result of normal wear and tear, and occurs most often on the areas of a garment that rub the most. In the case of a sweater, this is usually the underarm/underside of the arm. If you’re a fan of handbags that brush up against your torso (typically shoulder bags and crossbody bags that hang on the right or left side, whichever side you favor sporting your bag), you’ll often see pills on those areas too. Pilling is not a sign of quality, in fact the price of the garment does not determine if the sweater will pill or not. Sometimes you just don’t know what to wear. Some days you have to get out the door in a hurry. Those are the mornings when I reach for one of my grab and go outfits. Grab and go (also called fast fall back) outfits are those outfits that I’ve put together in advance. I typically plan at least a few outfits when I set up my capsule wardrobe at the start of each season. But what if I don’t want to wear any of my re-planned outfits and I’m getting dressed in a hurry? Here are 3 ways I get ready fast, without reaching for one of my grab and go looks. Now available as a paperback! 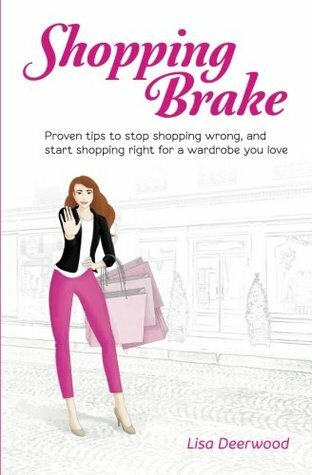 Today I’m excited to announce that the book Shopping Brake: Proven tips to stop shopping wrong, and start shopping right for a wardrobe you love is now available as a paperback! Filled with shopping tips, closet organization advice, and insights into the mindset of a shopaholic, Shopping Brake: Proven tips to stop shopping wrong, and start shopping right for a wardrobe you love will provide you with the tools that you need to own a wardrobe that you love. Thank you for supporting the Shopping Brake Family!